Yesterday I had the great pleasure of joining cameraman John Aitchison on a boat off the west coast of Scotland, filming common dolphins. 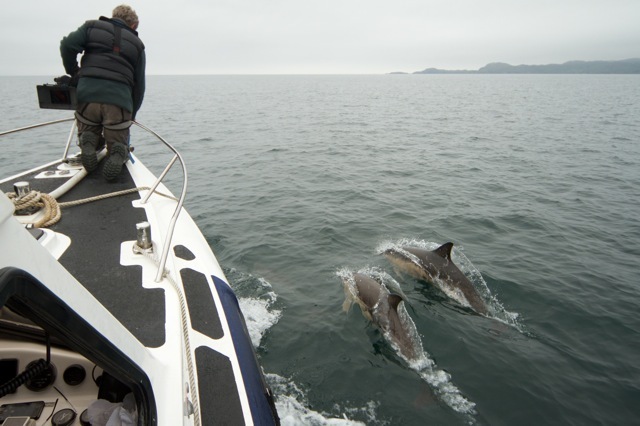 John’s busy filming for a new BBC series about the wildlife of the Hebrides and when I heard that sightings had been made of a super-pod of common dolphins I thought it might be something he’d like to film. Within fifteen minutes of boarding the boat John spotted some splashes in the distance. Skipper of the boat is my friend and fellow Knoydartian Mark, a marine biologist who has a lot of experience with dolphins. “Their preferred speed is 10 to 12 knots” he said, so that’s what we did and sure enough dozens of them were soon bow-riding alongside the boat. We estimated there were at least 400 dolphins all around and below us. We switched off the engine and drifted as they leapt from the water and dived down in a feeding frenzy, terns and gannets wheeling overhead. 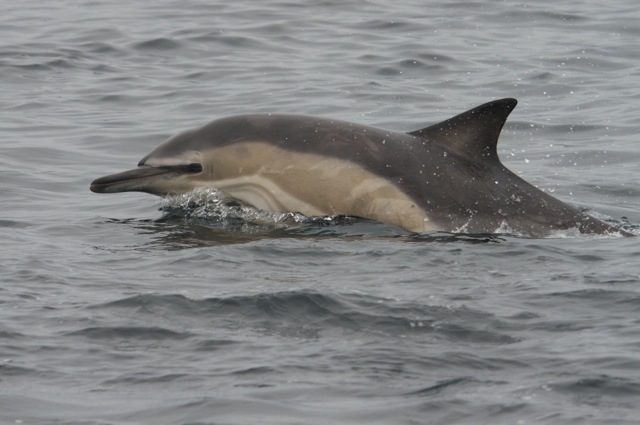 That wasn’t the only behaviour we witnessed: there were courtship displays as one dolphin rolled over to show its pale belly to its mate and we even heard some vocalisation as one dolphin held its head above water, clicking, possibly a mother or calf calling for the other. While John was filming I was busy with a stills camera. Getting a good photograph of dolphins is very hard; they appear for just a split second above the surface so you have to be quick and a little bit lucky. Of the several hundred frames I fired off this was the best. 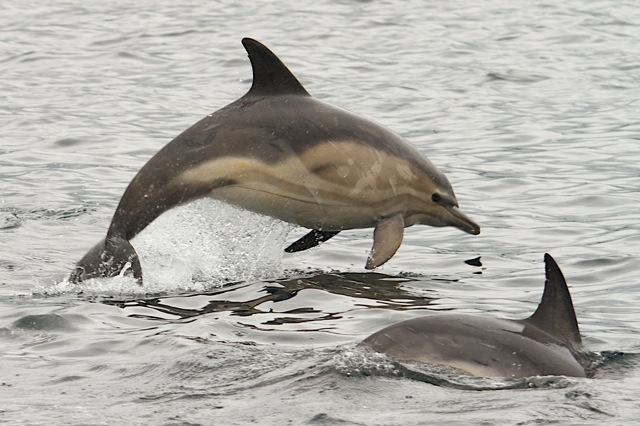 This entry was posted in Blog and tagged Delphinus delphus, dolphin, Scotland, super pod, wildlife. Bookmark the permalink.